I was a bit annoyed about not being around last Sunday to again do the gulls locally. The less said about a visit the Clevedon the better, but let's just say I wasted a day sitting about and walking around a pretty dire town centre to no avail. And for something I'd had to convince myself to go for anyway. But a few late weeknights with work nonsense have meant I've been unable to check the local gulls as much as I would have liked. 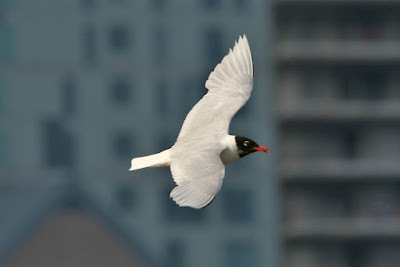 Even so, midweek it was noticeable there were a lot more Black-headed Gulls about (they're largely absent from Rotherhithe for the first three weeks of June each year). And then this evening, on the river near by home, I had this lovely adult Mediterranean Gull - the first one I've had in Rotherhithe this year. The plan was that I'd find my first juvenile Yellow-legged Gull of the year, as Jamie and Dante had been to Thames Barrier Park this afternoon and seen four, but it wasn't to be. Though I'm hopeful that'll change over the course of the next few days.